"The dramatic stakes may be higher with speed, cocaine, and certainly heroin, but these stories hit the mark." "Joyce Carol Oates is in a rare class of her own, but she's just of the right age to have experienced the '60s and its many forms of annihilating reality. So, too, are some of the other contributors to this collection, including Lee Child and the always enjoyable Raymond Mungo, who has traveled far, from the Haight of yore to the medicinal marijuana boutiques of today." "If you are a fence-sitter on the passionately contested pros and cons of marijuana use, after reading this terrific collection you will find yourself falling off and landing on one side of the hothouse argument. Which side? That is for the reader to decide...Akashic Books is to be commended for bringing this eye-opening series to a wider audience. 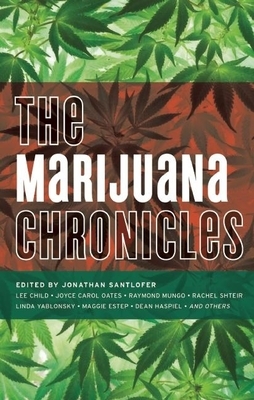 Fresh and informative The Marijuana Chronicles is a gem. Highly recommended." "This is a book that deserves an eye-level spot on every toker's book shelf-as well as a thoroughly stoned romp from intro to finale." "Pick up this hash-filled assortment, puff on any one of these killer buds and feel a different literary high each time. Marijuana Chronicles is meant to be savored one long drag at a time, allowing the flavor-filled pieces to slowly take over the mind, engulfing it fully." "The pieces and authors represent a breadth of perspectives that goes far beyond typical stoner fare." "The stories are astonishingly cerebral, and they are certain to make the rationalizations of even the most staunch supporters or opposers a bit hazy." "The Marijuana Chronicles, it has to be said, is a hopped-up little anthology that really smokes--there's really no better way to put it." "The Marijuana Chronicles...is the strongest, most diverse and entertaining collection of the series to date...highly (no pun intended) recommended, even for those who never inhale." Featuring brand-new stories, poems, prose, and graphics by: Lee Child, Joyce Carol Oates, Linda Yablonsky, Jonathan Santlofer, Abraham Rodriguez, Dean Haspiel, Maggie Estep, Bob Holman, Cheryl Lu-Lien Tan, Amanda Stern, Jan Heller Levi, Josh Gilbert, Edward M. G mez, Raymond Mungo, Rachel Shteir, Philip Spitzer, and Thad Ziolkowski. FROM THE INTRODUCTION by Jonathan Santlofer: "Like film, literature has been no stranger to marijuana and hashish, going back to Charles Baudelaire's 1860 Artificial Paradises, in which the French poet not only describes the effects of hashish but postulates it could be an aid in creating an ideal world. The pleasures, pains, and complexities of marijuana are more than hinted at in works by William S. Burroughs, Jack Kerouac, Allen Ginsberg, Henry Miller, Hunter S. Thompson, and Thomas Pynchon, to name just a few, and I hope this anthology will add to that legacy and keep the flame of pot literature burning bright . . .
"This diverse group of writers, poets, and artists makes it clear that there is no one point of view here. Each of them approaches the idea of marijuana with the sharp eye of an observer, anthropologist, and artist, and expands upon it. Some writing projects are difficult; this one was smooth and mellow and a continual pleasure . . . I hope you will sit back, relax, and enjoy these wide-ranging tales of the most debated and discussed drug of our time. Though, according to former California governor Arnold Schwarzenegger, 'That is not a drug, it's a leaf.'" Jonathan Santlofer is the author of five best-selling novels, The Death Artist, Color Blind, The Killing Art, Anatomy of Fear, and The Murder Notebook. He is the recipient of a Nero Wolfe Award, two National Endowment for the Arts grants, and has been a Visiting Artist at the American Academy in Rome, the Vermont Studio Center, and serves on the board of Yaddo, the oldest arts community in the US. He is coeditor, contributor, and illustrator of the anthologies The Dark End of the Street and LA Noire: The Collected Stories. His short stories have appeared in such anthologies and collections as The Rich & the Dead, New Jersey Noir, and Ellery Queen Magazine. Also a well-known artist, Santlofer's artwork is in such collections as the Metropolitan Museum of Art, the Art Institute of Chicago, the Newark Museum, Norton Simon Museum, and Tokyo's Institute of Contemporary Art. He is currently completing a new novel. A native New Yorker, Santlofer lives and works in Manhattan.